^ 1.0 1.1 Philip Smyth. The Shiite Jihad in Syria and Its Regional Effects (PDF). The Washington Institute for Near East Studies: 7–8. February 2015 [March 13, 2015]. ^ Levitt, Matthew. Hezbollah: The Global Footprint of Lebanon's Party of God. 2013: 356. Hezbollah's anti-Western militancy began with attacks against Western targets in Lebanon, then expanded to attacks abroad intended to exact revenge for actions threatening its or Iran's interests, or to press foreign governments to release captured operatives. ^ An International History of Terrorism: Western and Non-Western Experiences. : 267. Based upon these beliefs, Hezbollah became vehemently anti-West and anti-Israel. ^ Criminology: Theories, Patterns & Typology. : 396. Hezbollah is anti-West and anti-Israel and has engaged in a series of terrorist actions including kidnappings, car bombings, and airline hijackings. ^ Elie Alagha, Joseph. Hizbullah's Documents: From the 1985 Open Letter to the 2009 Manifesto. Amsterdam University Press. 2011: 15, 20. ISBN 90-8555-037-8. ^ Shehata, Samer. Islamist Politics in the Middle East: Movements and Change. Routledge. 2012: 176. ISBN 0-415-78361-5. ^ Husseinia, Rola El. Hezbollah and the Axis of Refusal: Hamas, Iran and Syria. Third World Quarterly. 2010, 31 (5). doi:10.1080/01436597.2010.502695. ^ Foreign Terrorist Organizations (FTOs). United States Department of State. 11 October 2005 [16 July 2006]. （原始内容存档于12 July 2006）. "Current List of Designated Foreign Terrorist Organizations ... 14. Hizballah (Party of God)". ^ Hezbollah – International terrorist organization. Israel Ministry of Foreign Affairs. 22 July 2013. ^ Bahrain's parliament declares Hezbollah a terrorist group. Jerusalem Post. 26 March 2013. ^ Listed Terrorist Entities – Currently Listed Entities. Government of Canada. Public Safety Canada. 24 March 2014 [11 July 2014]. 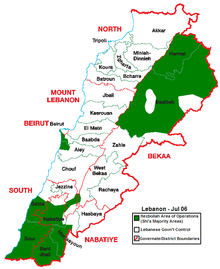 ^ Listed terrorist organisations – Hizballah's External Security Organisation (ESO). Australian National Security. [11 July 2014]. ^ Lists associated with Resolution 1373. New Zealand Police. 20 July 2014 [16 August 2014]. ^ Proscribed terrorist organisations. Home Office: 10. 27 March 2015 [6 July 2015]. Hizballah's External Security Organisation was proscribed March 2001 and in 2008 the proscription was extended to Hizballah's Military apparatus including the Jihad Council. ^ Jewish Leaders Applaud Hezbollah Terror Designation by France. Algemeiner Journal. 4 April 2013 [4 September 2013]. ^ Norman, Lawrence; Fairclough, Gordon. Pressure Mounts for EU to Put Hezbollah on Terror List. Wall Street Journal. 7 September 2012 [7 June 2015]. ^ Ravid, Barak. Azerbaijan: Iranian, Hezbollah Operatives Arrested for Plotting Attack Against Foreign Targets. 21 February 2012 –通过Haaretz. ^ Israel’s UN Ambassador Warns: Hezbollah Has 120,000 Hidden Missiles — More Than All European NATO Allies. ^ 真主党称已派兵参加叙内战 力挺叙利亚政府. 中国日报网. 2013-05-27. ^ 美将黎巴嫩真主党列黑名单. 联合早报. 2012-08-11. （原始内容存档于2012-08-13）. An Open Letter: The Hezbollah Program – five pages excerpted from Hezbollah's 1985 manifesto translated into English. The complete document is 20 printed pages in translation and may be found in Norton, Augustus. Amal and the Shi'a: Struggle for the Soul of Lebanon. Austin: University of Texas Press. 1987. ISBN 0-292-73039-X. Specifically: "Nass al-risala al-maftuha allati wajjaha hizb allah ila al-mustad'afin fi lubnan wa al-'alam [Text of an Open Letter Addressed by Hizballah to the Downtrodden in Lebanon and in the World]", Appendix B, pp. 167–187.